1 February - On an extremely windy evening the frog count at 9pm was down to 20, and I saw 4 newts. The wind has blown lots of plant debris onto the water which is very disturbed by the constant movement. I guess that this is causing some of the frogs to lie low until the storm is over! 2 February - After yesterday's gales it was almost surprising to see that the solitary Reedmace head has lost virtually nothing. This was despite the fact that the portion where it had already shed some seed was facing into the direction of the wind. I must clear some of the plant debris off the water today. A check at 9.30pm saw 22 frogs and 5 newts. It was raining at the time with only a slight wind. 3 February - A dull damp, and later very wet day has seen the first frog mating tussle, involving (I think) 6 frogs. I had noticed some activity in the small pond during the day, and when I walked past at 6pm I heard croaking and torchlight revealed this group, rolling about amongst the duckweed. I haven't got round to clearing bits from the pond yet. The rain has made the garden very soggy indeed (a lot more forecast tonight) so I do not want to walk on the pond bank too much at the moment. 4 February - Another day on which the weather was atrocious, with heavy rain leaving parts of the garden under water. At 9.30pm, after the rain had stopped, I did a frog count. As I splashed through the mud around the ponds, some 48 frogs were to be seen in them, the most yet this year. No tussles going on tonight, and I only saw 4 newts. It's funny, but I have not seen any frogs out on land all these nights that I have been checking numbers in the ponds. 5 February - Tonight's count at 9.30pm included 44 frogs (including 9 'pairs') and just 3 newts. Tonight more of the frogs were completely submerged - perhaps this reflects todays slightly colder temperatures. Unfortunately, I do not have a thermometer in the pond at the moment. 7 February - Last night was cold enough to produce a frost first thing this morning - just cold enough (1.5C air temperature) to put a thin layer of ice on the bird bath, but not the ponds. That ice had disappeared by 8am as the sky clouded over completely. 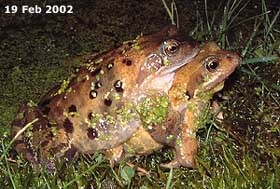 The lowering of the temperature had an effect on the frogs last night, and at 9.30pm I saw only 12, and no couples! I also spotted just 2 newts. 13 February - A gap of a week in my observations has not meant me missing the brginning of spawning - tonight at 10pm I have just counted 53 frogs in the two ponds ( and I may have missed some that dived under the pond weed as I approached), but no frog spawn. There were 14 'pairs'. 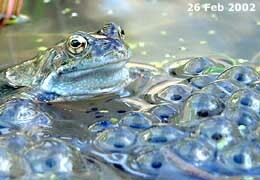 15 February - St. Valentine did not bring any frog spawn yesterday. 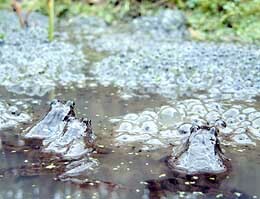 In fact, there was not a lot of frog activity to be seen on a cold day. 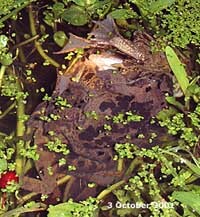 Last night's check of the pond at 10pm revealed only 14 frogs (10 paired) as the air temperature dropped to 2C. This morning there is a complete ice cover on both ponds and an air temperature of -1C at 8am. 17 February - The return of cold weather has brought the level frog activity back down to near winter levels in the pond, with just the occasional movements seen. Just had a look at 10pm and saw 15 frogs (including two pairs) and one newt. The air temperature is 4C with cloud cover, although a frost is forecast. 19 February - Milder weather has brought more activity today and although I was too busy to watch for most of the day, I couldn't help noticing the splashing and croaking in the ponds. 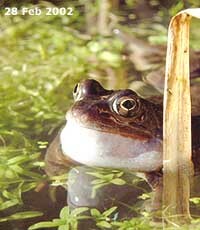 Tonight, with the air temperature around 9C at 9pm I could see at least 60 very active frogs in and around the ponds. For the first time this year I could see frogs moving about on land! No frog spawn yet, but I don't think there is long to wait. Before I forget, I also saw just a couple of newts (in the lttle pond). Around 10pm I needed to go out to my car. In pouring rain there seemed to be frogs everywhere. I 'rescued' 8 from the road at the front of the house, so there must be 70+ frogs in and around the ponds now. Many are paired up and some of the females look very plump. 20 February - Just a short note tonight. After all the activity yesterday, today has been disappointing. It has been colder (5C at 10pm) and this drop in temperature has resulted in very little activity being seen. When I walked down to the pond a short while ago there was hardly any movement to be seen - there were 30+ frogs in sight but they seemed pretty lethargic and I saw only one 'pair'. 21 February - Tonight the temperature is a little higher, 7.5C at 10pm. I have just counted around 55 frogs (including 6 'pairs'), all in the water and pretty lethargic. The ten newts I saw seemed to be much more active. 23 February - Today has not been a good day for the frogs. It has been cold (reached 7C but dropped back to 5C in the afternoon) with a strong Northerly wind - hardly a frog to be seen. At 9pm I could only see 7 frogs at or near the surface of the water as the air temperatured dipped to 3C. The wind also had an effect on the Reedmace - seeds could be seen floating away all day. 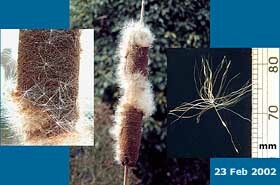 The seed heads are sensitive to the slightest movement of air and I had to take care not to breathe at the wrong moment when I took the close-up picture! 25 February - Today has been milder (10.6C at 10.30pm) and very wet and the frogs love it! They are all over the garden. When I used my car this evening I had to go round it moving frogs out of the way before I left, and then I had to clear the parking area before putting the car under the shelter on my return. There were well in excess of 80 frogs in and around the pond at 10pm. They were very active, chasing anything that moved, and at least 50 were with a 'partner'. 26 February - The first Frogspawn of the year. Heavy rain last night and milder conditions (11C at 11.45am) have obviously suited the frogs. 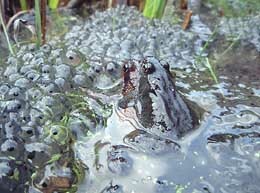 In water, clouded by the mud churned up by their frantic activities, the frogs have produced their first spawn of the year in the shallow end of the big pond. This is two weeks earlier than last year. Click on the picture for a larger version - not as sharp as I would have liked, but the water was continuously disturbed by frogs dashing about (and I was trying to avoid kneeling in the mud). To hear the frogs, Click here (a large .wav file - 164Kb) - they are accompanied by sparrows in the Ivy tree. 27 February - Just a brief note at 8.30am to say that there are now several square feet of pond covered with frog spawn and, despite the air temperature being down to 4C the frogs are still very active all over the area. By this afternoon the area covered had grown even more, with some spawn even deposited on the bank at one spot. The male frogs are still very actively seeking females that are ready to spawn, although these three looked as though they were taking a rest while surveying progress already made! These two frogs, with their very different colourations have found a quiet spot away from the chaos that seems to be prevailing on the other side of the pond. 28 February - On a sunny morning, after a cold start activity is once again at a high level in the pond. The shallow end of the pond must be three-quarter covered with spawn now. The calling for a mate continues - this individual has moved to a 'spawn free' area to do his calling. At lunchtime the noise is tremendous. I have just counted over 90 frogs on the surface - and some had disappeared into the deep as I approached, so there must be over 100 in the pond, and at least half of them seem to be croaking!